Centerstone, one of the nation’s leading providers of mental health and addictions care, partnered with Kevin Hines to produce Suicide: The Ripple Effect. Centerstone is planning a series of events to promote the film in Illinois, Indiana, Tennessee, Kentucky and Florida this Spring and Fall. 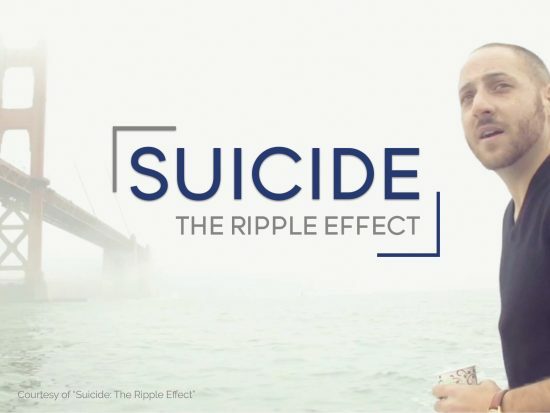 Suicide: The Ripple Effect shares the story of Kevin Hines, who at age 19, attempted to take his life by jumping from the Golden Gate Bridge. Hines is one of only 36 individuals to survive this jump. Seventeen years later he is on a mission to use his story to help others find hope and stay alive. The film is part of a global mission to help reduce the number of suicides and suicide attempts around the world. Monday, April 9, 2018, 7:00 – 9:00 p.m., Edwardsville, IL: Free screening with Kevin Hines. More information and registration. Tuesday, April 10, 2018, 7:00 – 9:00 p.m., Carbondale, IL: Free screening with Kevin Hines. More information and registration. Other event dates and information will be announced soon. Across the globe, nearly 1 million people die annually by suicide. In the United States alone there are one million suicide attempts every year and over 40,000 deaths by suicide, with our military being hit particularly hard. Research has shown that for every one death by suicide, over 115 people are directly affected and impacted. The estimated financial cost of suicide is over 50 billion dollars annually.